As the race grows tighter, Hunter is attacking his Democratic challenger for his Palestinian heritage. A controversial television ad accuses Ammar Campa-Najjar of trying to "infiltrate" Congress. It says that Campa-Najjar changed his name to hide his family's connection to terrorism. It points out that his grandfather was part of the deadly attack on Israeli athletes at the 1972 Munich Olympics. Campa-Najjar never knew his grandfather, who was killed by Israeli agents 16 years before the candidate was born. This is just one of the commercial's questionable associations. The Washington Post's Fact Checker gave the ad its worst rating: 4 Pinocchios, which it defines as "a whopper." Hunter was not available for an interview, and he has had no public campaign events during the time NPR reported on the race. But in remarks last month to a GOP women's group, he again made Campa-Najjar's name sound shady. "He changed his name from Ammar Yasser Najjar to Ammar Campa-Najjar," said Hunter, "so he sounds Hispanic. ... That is how hard, by the way, that the radical Muslims are trying to infiltrate the U.S. government." Actually, Ammar Campa-Najjar is Christian. And Campa is his Hispanic mother's family name. 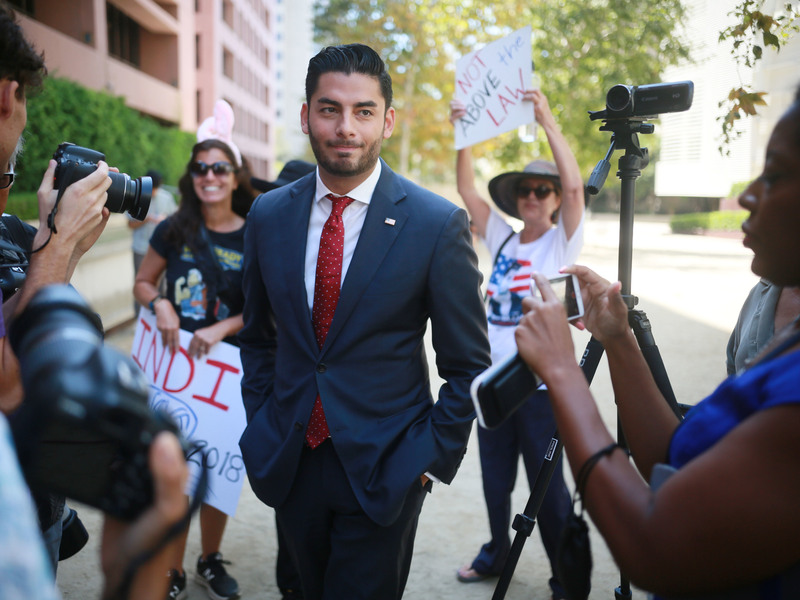 Ammar Campa-Najjar, who is running against Republican Rep. Duncan Hunter, speaks to reporters outside the San Diego Federal Courthouse during Hunter's arraignment hearing in August. Bonnie Sealey's view of Campa-Najjar is the exact opposite of Hunter's. She was one of about 60 Campa-Najjar volunteers who rallied on a cool, cloudy morning in the city of Temecula. "He's young. He's fresh. He's got great ideas," she said. "I'm impressed with his intelligence, I'm impressed with his humility, and I just think that he would be awesome for our district." The volunteers held up campaign signs on a street corner, cheering whenever a passing car honked in solidarity. Then the tall, skinny, 29-year-old first-time candidate took the microphone. His history as an Obama field director and low-level staffer in the administration showed. "Are you fired up? Are you ready to go?" he asked the crowd. "You know who else is ready to go? Duncan Hunter. It's time for him to go." Hunter's federal indictment is a gift to Democrats in the 50th Congressional District, where Republicans have a 14-point registration advantage. And Campa-Najjar came back to it over and over again. "We cannot in good conscience let a lawbreaker be our lawmaker anymore," he said. "We can't trust somebody to pass laws that he himself cannot follow." Polls suggest that the GOP advantage in this district has gone up in smoke. Campa-Najjar calls Hunter's attacks on his ethnicity a sign of desperation. But, recalling his Obama years, he says he has a role model who has been through this kind of thing before. "I was really inspired by a skinny brown guy with a funny name who became president," says Campa-Najjar, "and it ... was a validator for me growing up." Hunter argues that it is Obama administration holdovers in the Justice Department wielding their influence who are responsible for his current legal troubles. As he told a reporter from KGTV, the Department of Justice "is the Democrats' arm of law enforcement. That's what's happening right now. It's happening with Trump and it's happening with me, and we're going to fight through it and win." Another fact check: The United States attorney who approved the 60 criminal charges against Hunter is a Trump administration appointee. Whatever happens at the polls in November, Hunter knows that the next firm date on his calendar after Election Day is his Dec. 3 appearance in federal court. A Republican congressman once expected to waltz to re-election is now in the fight of his career. Duncan Hunter has represented an inland southern California district for a decade. In August, he was indicted for using a quarter of a million dollars in campaign funds for personal expenses. Now, as Hunter's lead narrows, he's going after his Democratic challenger for his Palestinian heritage. NPR's Ina Jaffe reports. INA JAFFE, BYLINE: Let's get right to it. This is part of the controversial Duncan Hunter campaign commercial attacking his Democratic opponent, Ammar Campa-Najjar. UNIDENTIFIED NARRATOR: Ammar Campa-Najjar is working to infiltrate Congress. He's used three different names to hide his family's ties to terrorism. His grandfather masterminded the Munich Olympic massacre. JAFFE: Campa-Najjar never knew his grandfather, who was killed by Israeli agents 16 years before the candidate was born. It's only one of the commercial's questionable associations. The Washington Post's Fact Checker gave the ad its worst rating of four Pinocchios, which it defines as a whopper. Duncan Hunter was not available for an interview, and he's had no public campaign events during the time we were working on this story. But in remarks last month to a GOP women's group, he again made Campa-Najjar's name sound shady. This was recorded by the Times of San Diego. DUNCAN HUNTER: And he changed his name from Ammar Yasser Najjar to Ammar Campa-Najjar so he sounds Hispanic. He just changed it again. He added a Joseph in there, so his signs could actually say Joseph Campa or something. That's - that is how hard, by the way, that the radical Muslims are trying to infiltrate the U.S. government. JAFFE: Just a little more fact checking here - Ammar Campa-Najjar is Christian, and Campa is his Hispanic mother's family name. JAFFE: On a cool, cloudy morning, about 60 volunteers for Campa-Najjar rallied in the city of Temecula. Bonnie Sealey said he's just what the district needs. BONNIE SEALEY: He's young. He's fresh. He's got great ideas. I'm impressed with his intelligence. I'm impressed with his humility. And I just think that he would be awesome for our district. JAFFE: Then the tall, skinny 29-year-old first-time candidate took the mike. AMMAR CAMPA-NAJJAR: Thank you. Thank you all for being here. Y'all fired up? CAMPA-NAJJAR: Are you ready to go? CAMPA-NAJJAR: You know who else is ready to go - Duncan Hunter. It's time for him to go. JAFFE: Hunter's federal indictment is a gift to Democrats in a district where Republicans have a 14-point registration advantage. CAMPA-NAJJAR: They say that we cannot in good conscience let a lawbreaker be our lawmaker anymore. We can't trust somebody to pass laws that he himself cannot follow. JAFFE: Polls suggest that the GOP advantage in this district has gone up in smoke. Campa-Najjar calls Hunter's attacks on his ethnicity a sign of desperation. And as a low-level staffer in the Obama administration, Campa-Najjar says he has a role model who's been through this kind of thing before. CAMPA-NAJJAR: I was really inspired by a skinny brown guy with a funny name who became president. And it kind of was a validator for me growing up. JAFFE: Duncan Hunter argues that Obama holdovers maintain a sinister influence on the Justice Department, and he blames Democrats for his current legal troubles, as he told a reporter from station KGTV. HUNTER: This is the new Department of Justice. This is the Democrats' arm of law enforcement. That's what's happening right now. And it's happening with Trump, and it's happening with me. And we're going to fight through it and win. JAFFE: Another fact check - the United States attorney who approved the 60 criminal charges against Duncan Hunter is a Trump administration appointee. Whatever happens at the polls in November, Hunter knows that the next firm date on his calendar after Election Day is his December 3 appearance in federal court. Ina Jaffe, NPR News. (SOUNDBITE OF GALT MACDERMOT'S "COFFEE COLD") Transcript provided by NPR, Copyright NPR.